Who doesn't love fried chicken coated with delicious and pungent sauce base? That's what we're going to make today to make you crave for more. This Korean recipe is quite popular worldwide and can be made easily at home. You can moderate the sauce ingredients as per your taste. The key to getting the required crispness within chicken wings is to fry them twice at different temperatures. Use canola or peanut oil to get the best results. 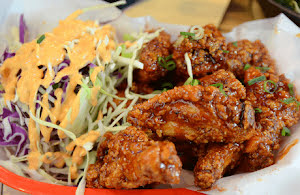 Although these piping hot wings are garnished with roasted sesame seeds, I prefer to serve them plain. If chicken wings are not available, legs can also be used though you may have to moderate the frying time. It's time to make these hot and crispy Korean chicken wings. Savor this hot and spicy chicken wings recipe glazed with a delicious and mouth-watering sauce base which enhances the flavor of this recipe by many folds. Take a large bowl and add chicken wings in it. Add minced ginger, ground black pepper and salt in it. Mix with hands and keep the bowl aside. Take a large nonstick skillet and heat 2 tsp peanut oil in it. Add minced garlic and stir fry for about half a minute. Add brown sugar, light soy sauce, Dijon mustard, rice vinegar, crumbled dried red chilies, sesame oil, and honey in the skillet. Keep the flame to medium and continuously stir till the sauce reaches the right consistency. Strain the sauce through a fine mesh to remove any lumps and chili crumbs. Heat generous quantity of canola or peanut oil in a heavy bottomed frying pan. The temperature of oil should be between 155 °C to 165 °C. Add cornstarch in the seasoned chicken wings bowl. Pat the starch coating on the wings. Gently fry all the wings in batches for about 6 to 8 minutes. Increase the oil temperature to around 185 °C. Again fry all the chicken wings in batches till they turn golden brown. Reheat the sauce again till it start bubbling. Pour the sauce over hot and crispy fried chicken wings. Garnish with chopped spring onion leaves and serve with shredded cabbage.